Part of an exclusive 19th Century barn conversion development, Welford Cottage provides an excellent standard of accommodation in a truly peaceful countryside setting. 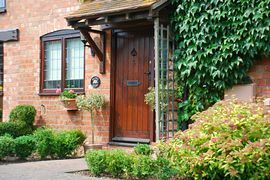 Perfectly placed being just a five minute drive to Stratford Upon Avon and on the borders of the gorgeous Cotswolds. 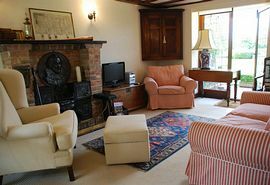 Welford Cottage was sympathetically refurbished in the Summer 2009 and can comfortably accommodate 4 people. It is beautifully decorated throughout with antiques and period pieces, has beamed ceilings, a feature fireplace and skylights in the bedrooms that catch the sun from all aspects. On the ground floor there is a bright open plan lounge/dining room. Kick-back and relax in a comfy armchair with a glass of wine, listen to some music, watch the TV which has Freeview or choose from the cracking selection of DVDs at your disposal. From the lounge; French windows open out onto the private terrace garden, with seating for 4 people and open access to the landscaped communal garden. Off the entrance hall there is a downstairs toilet and the staircase which leads to the first floor with a stylish new bathroom and two elegantly furnished bedrooms - one with a king-size bed and the other with a double bed, portable TV and space for a cot. Both bedrooms have built-in wardrobes and most importantly, comfy mattresses. A Welcome Pack is provided which includes tea, coffee, sugar, milk, juice, olive oil, condiments and biscuits. And for your convenience, all bed-linen, fluffy towels, loo rolls, cleaning materials and fresh flowers are included in the rental price. TV with Freeview in the lounge. DVD player (Plus, a good selection of DVD's for you to dip in to). Flatscreen TV-DVD with freeview in the 2nd bedroom. iPod docking station (bring your own iPod). Sorry - no pets are allowed and there is strictly no smoking in the cottage. 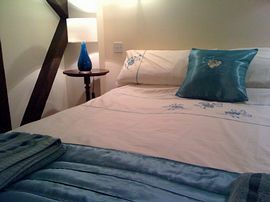 Quality bed linen and towels provided (bedding not supplied for the cot). Sorry pets are not permitted to stay. Sorry smoking is not permitted inside the cottage. Sun terrace with garden bench, table, 4 chairs and parasol. Those travelling by car can reach Stratford upon Avon via the M40 motorway. Exit the M40 at Junction 15 and then follow the road into the town centre. On entering the town take the A3400, then turn right onto the B4632. The cottage is situated 3 miles further down this road. 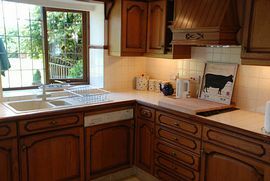 Low Season: (Jan, Feb, March, Nov, Dec excluding Christmas;New Year;Valentines) £390.00 per week. Mid Season: (April, excluding Easter, Bank Holidays & School Half-Term week, May, June, Sept) £440.00 per week. Peak Season 2010:(July & August) £495.00 per week. The cottage is available to rent all year round. "A truly gorgeous cottage in a perfect spot. Thank you for a very relaxing break!" Mr & Mrs S Jervis, Filey, July 2009. "What a delightfully comfortable stay we have had - love the cottage, tranquil views and a local woodpecker! We will be recommending you to other Cotswold lovers!" Ray and Rachel, New Zealand, August 2009. 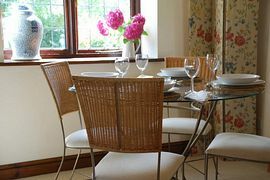 "We all four have had an excellent stay in your charming, beautifully decorated and well situated cottage, so close to Stratford, we will recommend it to others." The Greuter family, Netherlands, August 2009.